Look at this anchor. I can’t quite get my head around it. I don’t think it’s particularly dangerous or anything. In fact, it looks pretty bomber. It’s just…well…weird. It’s a textbook case of the over-engineered climbing anchor. The methods employed are ‘unconventional’ in the world of climbing anchors. There is a piece of what looks like 6mm perlon cord quadrupled around the tree–wrapped so many times that it can’t reach around the tree. It seems that a double wrap would have made it around the tree and still provided redundancy. And then–this is where it gets really strange–there appear to be two spectra/nylon blend double runners, doubled over (to shorten them) and then tied directly to the 6mm cord. And to provide redundancy, there is a sliding ‘x’ style loop at the power point–lest the whole works fail should one tied end of those slings fail. I say sliding ‘x’ style because there’s no way that bulky wad of spectra and nylon is going to ‘slide’. It’s essentially a case of using a dynamic equalization technique to end up with an effectively statically equalized anchor, leading us to ask why? Two locking ‘biners opposite and opposed. Bomber. This anchor isn’t going anywhere. It’s a top rope anchor attached to super stout natural pro. It’s just weird. This entry was posted in Natural Pro Anchors and tagged anchor, climbing, climbing anchors, Colorado, ice climbing, Ouray, ouray ice park, sliding x, USA on June 18, 2013 by Steve. Im not sure I see the same thing as you. I see two dynema/nylon cords as seperate sliding-x’s around individual rabbit ears created around the runners by the cordalette. Again, nothing particularly unsafe, but very strange and way time consuming. Def simpler systems to be had using that material (or much less). I have become a big fan of the “wrap 3 pull 2” type anchors. 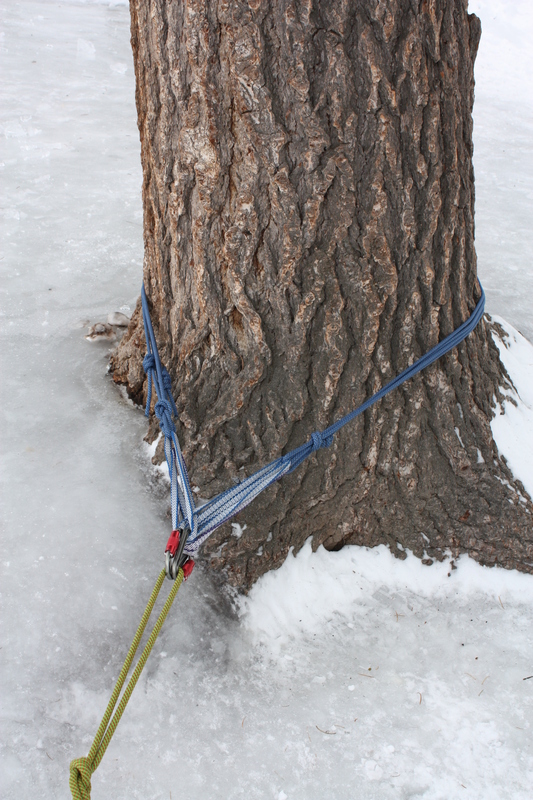 I see them all the time around trees… when all the time when people who know what they are doing set up anchors. I have taken to the untied cordalette for “alpine toprope anchors for just this reason. I think we’re seeing the same thing here. Yeah, I agree that this anchor fails the “T” (timely!) in “EARNEST”. It looks really labor intensive. and why does the yellow rope have a knot in it? Good question Johngo. Why does it have a knot in it. Can’t top rope that way. I didn’t ask. Then again, no one was around to ask. They were down in the gorge.